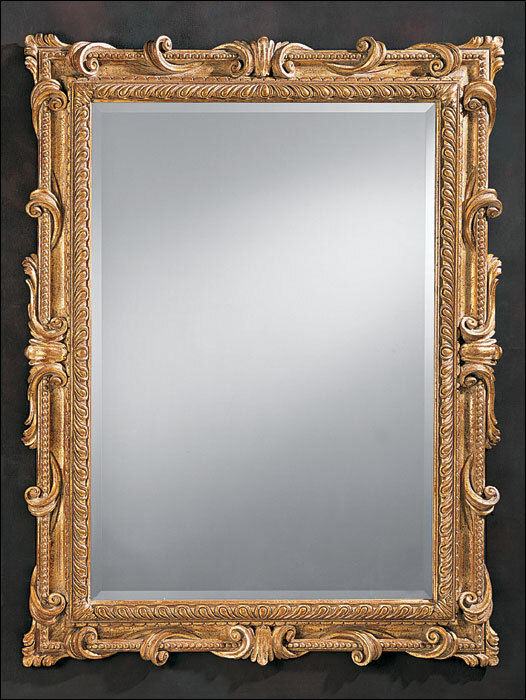 When you look into a mirror, are you happy with what you see? If you are not happy with what you see, then how can you expect others to be happy with what they see? The mirror doesn’t lie, it brutally and honestly tells the truth in so many ways. Stuck on Stubborn ! ! ! Have you ever tried to help someone who stubbornly refuses your assistance? Isn’t this frustrating to know that deep down in your heart you are trying to help someone and they just absolutely are not trying to hear a word you are saying? Sometimes you just can’t help someone who is “stuck on stubborn”, but at least you can put forth the effort to try. Even though they may have given up on everything, you should not give up on them. Keep trying because eventually these people who are “stuck” will see the light and you will break through their “stubbornness”. Believe me, once this breakthrough happens, the person you have just helped will be thankful you did. Visit Leadertank.com for more Leader tips, tools, techniques, and resources. I grew up in the 70’s and 80’s and worshipped a lot of the musicians and actors of my time just like any of the kids do exactly the same today. Sure, I never really got to meet any of them and only got to see or listen to them if and only if they were on the television or radio station I was listening to at the time and was lucky enough to have a blank vcr tape or cassette tape ready to hit record, otherwise I missed it. Today, it is much different from when I grew up. With the ever expanding wave of media formats that are exposing today’s “Teen Idols” to more people in more countries brings a revolution in Leadership opportunities and influence for these young artists to make an amazing impact on our children’s lives and culture. Justin Bieber is one such “Teen Idol” that could make a huge impact. Instead of just tossing his name and face on watches, cologne, posters, lunch boxes, and the plethora of many other products that industry is looking to make a dollar off his image, why don’t some organizations use him as a public service representative to speak to kids about things? It makes me wonder, are there any positive organizations out there trying to use these “Teen Idols” to make a worldwide influence on something other than mommy and daddy’s wallet. I believe that would be amazing if someone like Justin Bieber was to put on miniature “free” shows at High schools, churches, and other organizations with a positive message that will motivate, inspire, and more importantly influence kids to be something greater than they could possibly ever dream. The concept would be to go from “Teen Idol” to “Teen Leader” and lead a revolution of young minds to a future of amazing possibilities. Visit Leadertank.com for more motivational and inspirational messages just like this one. You are always on display. The things you do and say can have a profound effect on other people whether positive or negative. Whether you know it or not, someone is always watching and listening to every word you say and every move you make. By doing this, people watching and listening to you are learning by the actions you take, and don’t take. There are many things that can be learned from watching others, and emulating the actions they take. Highlighted below are some concepts that further discuss this idea. Most people are visual learners and learn better by being visually stimulated with pictures, video and real life examples of people they trust and respect. Giving someone a visual example shows them exactly what and how something should be done. This clears up most confusion and questions the individual may have. Even though someone shows you what and how to do something, keep in mind that this may not necessarily be “the way” to do something but instead “a way” of doing something. Once you have a clear picture of what and how to do something, don’t hesitate to put a little of “you” into it as long as the desired result/outcome is still accomplished. From the very beginning of life, children learn from watching their parents and emulate the things they hear and see their parents do and say. The old saying of “monkey see, monkey do” goes into effect here as a child will surprise you by doing exactly what they hear and see you do as a parent. This was apparent as one day as I had company over at the house, and my three year old son immediately repeated the “expletive” one of my guest said out loud upon stubbing his toe on one of my chairs. As a child gets older and more independent, the child still learns from things they hear and see their parents and others do, but will put their twist on it to make it their own. Sometimes when we hear or see something we like, we want to adopt it as our own. So what we will do is tweak what we see or hear to our likes and dislikes to make it our own. There are so many great examples of things happening in the world that we often adopt all these great things to match, enhance, or build our own successful way of creating, doing, and saying things. There is nothing wrong in emulating what you hear and see others do as long as you give credit where credit is due. Next time you think about saying or doing something, keep in mind that “you are always on display” and the things you say and do could be emulated by others to include children. If you want to make a positive impact or influence on someone, then it is up to you to establish habits of doing and saying positive things, as negativity can have a profound effect on someone. If you believe that the resources found here at Leadertank.com have been valuable, please feel free pass this site on to all your friends and family and let me know by dropping me a line at leadertank@gmail.com. I would love to connect and hear what you have to say. Love thy neighbor ! ! ! 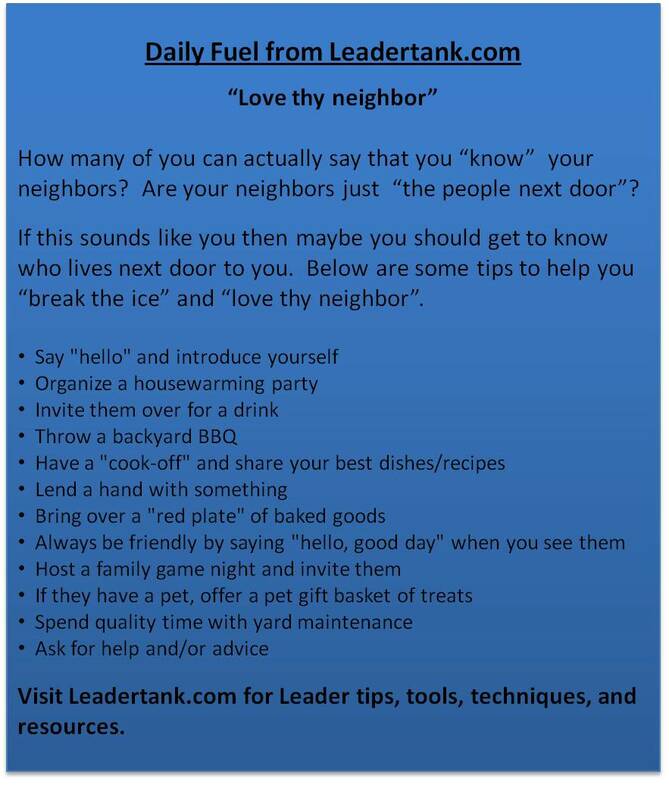 Join the conversation and tell us your tips to “welcome a new neighbor”.